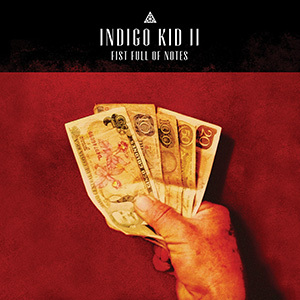 FOR GUITARIST Dan Messore, the different yet similarly broad landscapes of his two spiritual homes – Pembrokeshire, Wales and Santa Teresa, Costa Rica – feature prominently in his compositions for this second Indigo Kid release, Fist Full of Notes. Messore’s well-received debut Indigo Kid album, in 2012, was encouraged and led by renowned saxophonist Iain Ballamy (who the guitarist studied under in Wales) – and whilst Ballamy returns for a couple of numbers here, he introduces creative tenorist Trish Clowes to take up the lead sax role. From the original quartet line-up, bassist Tim Harries remains, but drummer Martin France makes his first appearance with the ‘Kid. Strikingly progressive in feel, Dan Messore has developed this band’s musical atmospheres of jazz, folk and country to judiciously include electronics/effects which complement and sustain the original, open, acoustic sound; and the transformation can become cinematic (maybe that’s the clue to the curious ‘fist full of notes/dollars’ title idea), often with satisfying prog rock grandeur. The key to the success of the project lies in the constantly shifting textures which Messore and his team employ; here is a straightforward quartet/quintet line-up, yet the clever written and improvisational stratification – organically building, evolving and fading – defines the enticingly alternative approach. So, there are familiar jazz territory run-outs, such as Trish Clowes’ sunny pairing with Messore in lightly shuffling All Hands to Dance and Skylark, recalling the saxophonist’s work with guitarist Chris Montague (including the later inclusion of layered effects); but then the intense, rock-heavy aura of From Nowhere to Our Place excitingly summons the spirit of Robert Fripp and King Crimson. The mellower side of Clowes’ very distinctive tone announces folksy Snow on the Presellis, its easy-going, guitar-rich demeanour perhaps leaning closer to Central America than mountainous South West Wales; and Mr Randall creates a fascinating blend of experimental jazz fusion and early prog as Harries’ wah-wahed electric bass combines with France’s fabulously intricate drumming over disquieting electronics. Dan Messore’s style has been likened to that of guitar legend Richard Thompson (though you could easily put John Etheridge, John Abercrombie and Bill Frisell into the mix, too). That self-accompanied folk style comes out in one of two pieces dedicated to his late father – the Soft Machine-imbued expanse of Carpet Boys; and The Healing Process reveals the familiar, deep, mellifluous signature of Iain Ballamy. Waiting for Paula is quietly majestic, the echoic searchings of Clowes and Messore contrasting well with sparky rhythms delivered by Martin France – a perfect example of the cohesion within this ensemble; and interlude Quiet Waters does indeed ripple calmly to picked guitar and confident melodies, followed by the perky country-rock of The Bay. To close, Iain Ballamy again swells the ranks in Sketches in the Fabric, Tim Harries’ incisive electric bass driving its infectious jazz/rock energy. It’s great to hear a fresh approach to contemporary jazz, and Dan Messore’s compositional and improvisational prowess flourishes amidst the distinguished musical company he keeps. Released on 13 July 2015, Fist Full of Notes is available at Babel Label.